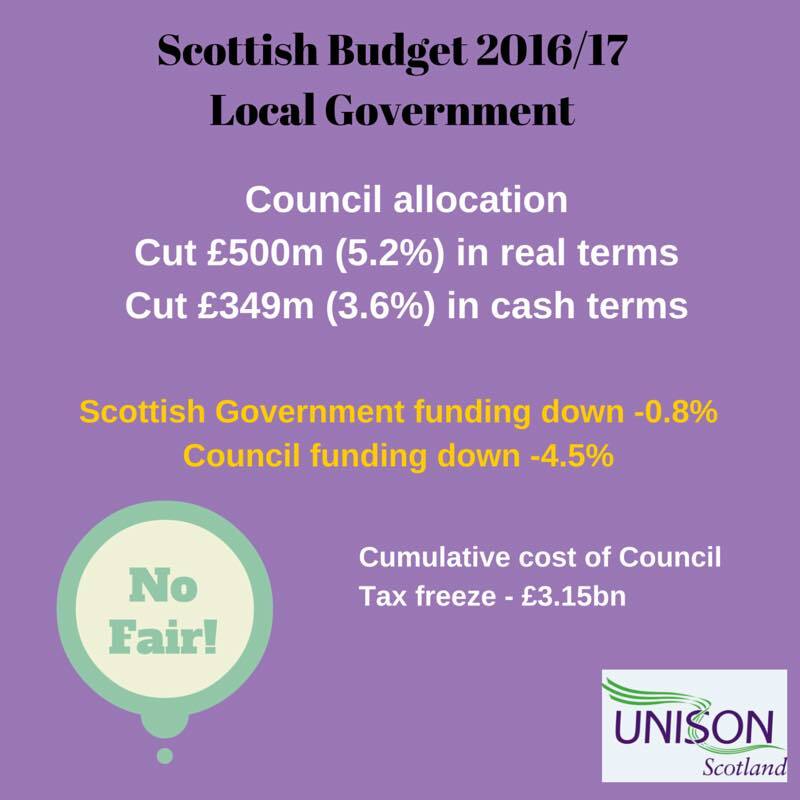 In recent days there have been many political exchanges over job losses as a consequence of the cuts to council grant allocations in the Scottish Budget for 2016/17. Let’s look at the issue calmly. John Swinney’s view is that job losses have been “utterly exaggerated”. Christina McKelvie MSP says, “But there are not 1,000’s losing jobs, that’s just made up”. The most widely quoted estimate for job losses is 15,000. 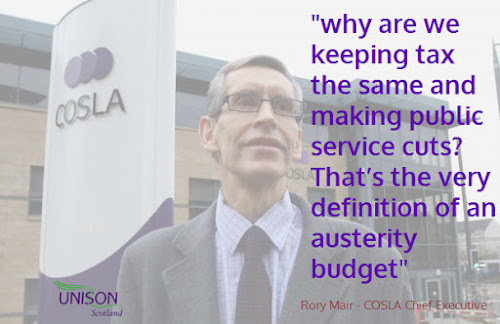 This figure doesn’t come from the trade unions; it comes from COSLA. They do after all after access to most of the councils and their senior officials that actually have to deliver the cuts. I am not a party to their calculations, but it is clear that they are based on the consequences of both the grant allocation cut and the additional unavoidable commitments councils have to finance next year. What we do know for certain is the combined General Resource Grant + Non-Domestic Rates Income figure, which is used to calculate local government’s total revenue settlement, falls by 5.2%, or more than £500 million, in real terms (the equivalent figure in cash terms is a reduction of 3.6%, or £349m). We don’t know the sum total of the additional commitments, although the largest element is likely to be the increase in National Insurance contributions that COSLA estimates at £125m. That alone takes the cash cut to £474m, but in practice it will be much higher when you take account of other service pressures. If we look back historically, SPICe calculates that the local government budget fell by 6% between 2008/9 and 2015/16. We also know that local government employment during that period fell from 314000 to 244,800 (latest figure). Allowing for police and fire transfers that means at 42,400 jobs were lost during that period. We generally round that figure down to 40,000. It isn’t a linear calculation to say a 6% cut equals 40,000 job losses, but it does give you an idea of the scale of the employment challenge when councils are facing at least a 5.2% cut in the coming financial year. The reason no one can give a precise figure is because councils will use a variety of measures to make the cuts. Some will use reserves or other financial instruments to mitigate some of the cuts. Some service cuts are more staff intensive than others, although council services by their nature are staff intensive. The proportion of the budget that constitutes staff costs depends on how you calculate total expenditure, but a rough figure for most councils would be around 60%. From local budget consultations that have taken place, we do have some idea of job losses. Several councils have provided estimates although they should be used with caution given that they depend on negotiations and other savings assumptions, including cuts in terms and conditions. However, some 8000 job losses have been identified so far and we expect that number to grow as budgets are finalised. So, are the job loss estimates ‘utterly exaggerated’. Historical precedent would say they are not. At best you could say they might be less than 15,000. Our more optimistic estimate has been 10-12,000 and those may not all be implemented the coming financial year. Our estimates have proved to be fairly accurate in the past, but there are too many variables at present to be sure. We can be pretty certain that the number will be many thousands - so I’m afraid Christina McKelvie needs a reality check. The bottom line is this. If anyone can explain how you can cut over £600m from council budgets, when 60% of spending goes on staffing, without job losses – then I would love to hear from them. Our local government members across Scotland would be delighted to see that magic trick. The Scottish Budget is debated at Stage 3 in parliament tomorrow. 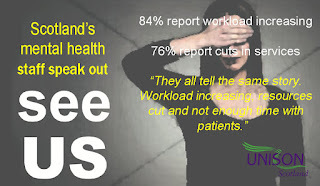 While there is plenty of pain for all public services, it is local government that is bearing the brunt of austerity in Scotland. In our MSP briefing, I set out the implications of the budget for all public services - little of it is positive. However, the focus of the debate inside and outside parliament has rightly been on the local government budget settlement. The budget allocation to local government in 2016-17 will be £10,152.3m, a substantial reduction on the 2015-16 allocation of £10,756.7m, even allowing for some reprofiling of capital expenditure. Within this allocation, the combined General Resource Grant + Non-Domestic Rates Income figure, which is used to calculate local government’s total revenue settlement, falls by 5.2%, or more than £500 million, in real terms (GDP deflator - inflation). The equivalent figure in cash terms is a reduction of 3.6%, or £349m. Both numbers are often bandied about, so it is important to differentiate them. It is worth mentioning that the income from non-domestic rates is the second largest source of revenue after the Scottish Rate of Income Tax (SRIT). This year the estimated revenue is down by £31m, 2.8% in real terms. 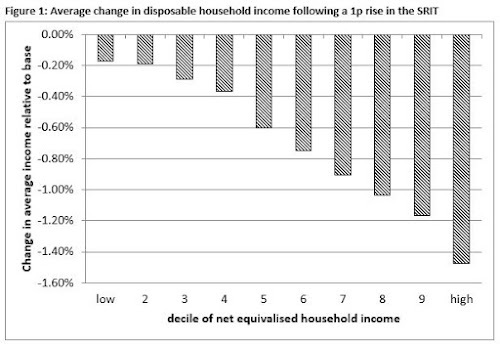 This decrease does not reflect the Scottish Government’s optimism about economic growth and in previous years the estimated income has risen considerably, e.g. by £150m last year. We can only hope that this isn’t a backdoor way of creating an under spend to the Scottish Government budget. Scottish ministers often argue that local government has had a fair share of the Scottish budget over the years. This is a dubious claim when you consider that councils are the only main spending portfolio to have suffered a cash cut. However, it certainly isn’t true this coming year. 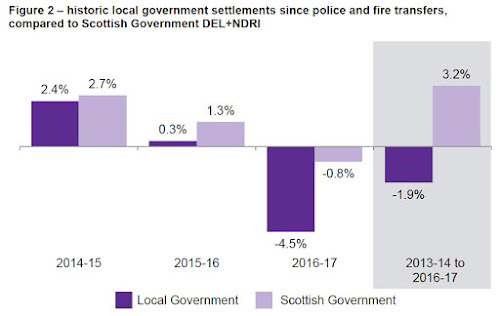 Local government’s percentage share of the Scottish budget also falls 1.7% from 32.3% to 30.6% in 2016-17 (although on a like for like comparison, the percentage share falls by 1.1%). If we take a slightly longer look, we can see that the Scottish Government is cutting councils more than itself. Since the 2013-14 transfer of police and fire, the local government settlement has fallen by 1.9% in real terms (-£200.9m), whereas the Scottish Government’s DEL+NDRI has increased by 3.2% in real terms (+£1,018.8m). 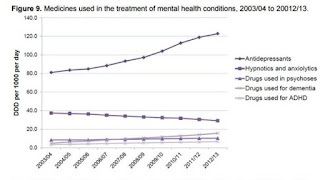 This chart from SPICe illustrates this point. In addition, councils have been blocked from increasing the Council Tax. This brings the total cost of the freeze in 2015-16 to £630m, and the total cumulative cost from 2008-09 to 2016-17 to £3,150m. Just imagine how many services and jobs could have been saved with this resource. COSLA has estimated that this settlement will result in 15,000 job losses. It is difficult to estimate actual losses because it depends on the services councils decide to cut and how they use reserves and other financial instruments. Unavoidable commitments, such as employer National Insurance contribution increases (£125m for councils alone), will add to the pressure. Even if 15,000 is at the higher end, we know for certain that of the 50,000 jobs lost in devolved services since the crash, 40,000 of those are in local government. That certainly feels like councils are taking the brunt of austerity. As the First Minister has fairly pointed out, unless you increase the overall budget available, protecting one service area inevitably means cuts to another. It used to be the case that the Scottish Parliament didn’t decide the size of the budget; it was largely limited to how it is divided up. That is no longer the case, because Parliament now has the Scottish Rate of Income Tax. We agree that the Calman powers are flawed, but they are still progressive and there will be an opportunity to make it more progressive when the new Scotland Bill’s powers are implemented. 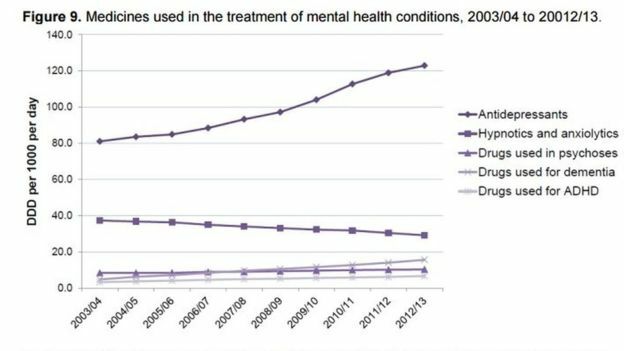 I fully accept that the root cause of these cuts is the UK Government’s ideological attack on public services. However, devolution is about doing things differently in Scotland. We have the powers to mitigate austerity as we outlined in our report last year and by using the new tax powers. 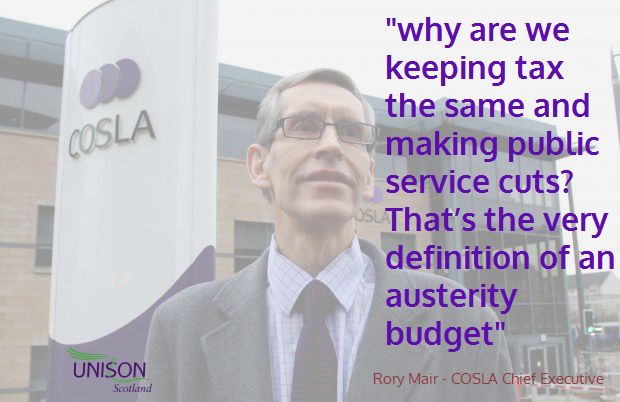 MSP’s should choose to combat austerity, not simply pass it on to community services. The tax dodging activities of companies has come under a lot of scrutiny, but we could do more to tackle this abuse in Scotland with existing powers. Companies who want to bid for taxpayer funded contracts should pay all their taxes. Even the EU has been shocked over the methods used by multinationals minimise their tax liabilities in Europe. We have had the Luxleaks revelations, media exposure of how hundreds of global companies including Pepsi, Ikea and FedEx had secured secret sweetheart tax deals with Luxembourg, allowing them to save billions of euros in taxes. Before that it was transfer pricing and investment loopholes that allow big companies to pay less tax. This abuse also has an impact on global poverty. Just 62 billionaires own the same wealth as half the world’s population – that's 3.6 billion people. This extreme inequality is being fuelled by a global network of tax dodging. Poor countries are losing at least $170 billion a year to tax havens – money that is desperately needed for vital services like healthcare and education. We don’t tend to think of Scotland when tax havens are discussed. However, as the Sunday Herald recently reported, Scotland is being advertised as a tax haven across Eastern Europe. As one advert proclaims; "Having registered a company in Scotland, by using offshore rules, you do not need to carry out any audits and, furthermore, there is no requirement to provide financial reports." The number of limited partnerships in Scotland has more than doubled from just over 6,000 to nearly 15,000 since 2009. We now have more of these firms than England and Wales put together. Scottish Labour raised questions about this last summer after an international investigation into the alleged fraud of three Moldovan banks uncovered that some of the companies used were in Scotland. Labour's Jackie Baillie said: "It is extraordinary that Scotland is being described as an offshore tax zone. Somebody should be looking long and hard at how to close this loophole." The Scottish Government has urged Westminster to simplify the UK tax system and abandon what it claims is; “the unnecessary complexity which creates opportunities for tax avoidance through countless exemptions, reliefs, deductions and allowances”. The House of Commons Treasury Committee has launched an investigation, with the Chair making similar observations about complexity. The Scottish Government’s tax avoidance measure used by Revenue Scotland is better than the UK approach. However, the same cannot be said of procurement. The public sector spends some £11bn each year in the private sector and this should be used as part of stronger efforts to tackle tax dodging and tax avoidance. It is entirely wrong that companies seeking to avoid paying their fair share of tax should be awarded public contracts. The Public Contracts (Scotland) Regulations 2015 were considered by the Infrastructure and Capital Investment Committee last week. UNISON’s briefing to MSPs questioned why the Scottish Government is not using powers that it has for mandatory, rather than discretionary, exclusion of companies that have not met their tax obligations and /or breached environmental, social and labour laws, and to exclude companies involved in aggressive tax avoidance? If we had these provisions in place, Anglian Water, or almost any of the privatised UK water companies, would be highly unlikely to have even bid for the public sector water contract. We have demonstrated how this can be done (including a 2014 proposed amendment to the Procurement Bill). It has been argued that it is too complex for procurement managers. The solution is to require companies to sign up to the Fair Tax Mark. A Scottish firm, SSE was the first company to do so. Given the Scottish Government’s rhetoric on tax dodging and the practical steps in the Revenue Scotland and Tax Powers Act, I am at a loss to understand why they are not taking action on procurement. Local and regional authorities across Europe are taking a stronger line than Scotland. The bottom line should be – companies who take the taxpayers pound, should pay their taxes in full. There are major changes happening to our pensions, many of which workers are ill equipped to face, and policy is not keeping pace with the challenges ahead. Today, I was at the TUC pensions conference. 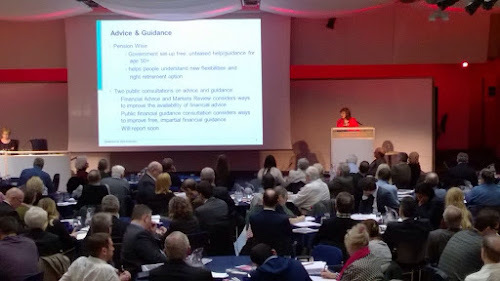 The pensions minister, Ros Altmann, gave an overview of government pension policy including auto enrolment, pension flexibilities, potential changes to tax relief and the impact on Defined Benefit schemes. Auto enrolment opt out rates are very low at only 10% and this has undoubtably been a success. It's too early to be sure how successful in Scotland as a number of big employers with quality schemes have deferred their start date. The big challenge is that only 10% of employers have started a pension scheme - 1.8m employers have yet to start. Small employers are a particular problem as they have less capacity. We should also be concerned about the quality of some schemes and many employers are not choosing a tax efficient scheme. Keeping the trigger at £10,000 is a help, but still discriminatory against part-time women workers. The minister accepted the need to strengthen consumer protection, particularly when the secondary annuity market kicks in. The Minister argued freedom not to buy an annuity was a positive move, emphasising unbiased guidance from Pension Wise. There were plenty of sceptics in the audience on quality of advice available and £millions flooding out of pensions as a result. Is a 45 minute interview really adequate for such a risky decision? This will all create huge long term problems for a short term gain to the Treasury. She also recognised the challenges facing Defined Benefit schemes, not least because of the end of contracting out this April - another cash cow for the Treasury at the expense of quality pension provision. The volatile investment market is another challenge and how pension funds respond with new risk models. Sadly, very few answers from the minister on this one. Otto Thoresen from NEST pointed out the challenges for people having to make complex decisions about what to do with their pension pot. You need to be an investment manager, actuary and have an all seeing crystal ball! NEST is seeking to provide an option that provides flexibility, but retains a default pathway. Gregg McClymont, former shadow pensions minister, now at Aberdeen Asset Management, described government policy as changing savers into investors. For those in DC schemes they are no longer pension savers, they are pension investors. He also emphasised the skills people need to make informed decisions as being Nostradamus and Galileo merged. Most people will need a lot of help to make the right decisions. David Pitt-Watson from the London Business School questioned how someone who pays into a DC scheme all their working life can be assured that they will have a sustainable income in retirement. They want trusted providers and strong consumer protection. They also want a simple system to achieve a predictable income for life. DB schemes provided that predictability, but DC schemes with annuities suffered from low interest rates and excessive profits. This matters because the rich don't need to worry, but the poor will run out of money - they need large scale collective provision for DC schemes that shares risk. Experience elsewhere in Europe shows that this could deliver between 30% and 60% higher returns. Government is failing to deliver the framework for this. The discussion focused on the weakness of market systems. What people really need is a better state pension scheme, rather than a market they don't understand run by providers who have a track record of ripping them off. We should also remember that the move to DC is also driven by employers wanting to cut costs and transfer risk to workers. Owen Smith MP the Shadow Secretary of State for Work and Pensions said we need a much more robust assessment of pension reforms, particularly for those with small pension pots. He argued that government has been gambling with future pension provision. Discussion has become muted about the impact major demographic changes, growing household debt, falling saving ratios, declining wages and job insecurity all have for pensions. Women pensioners are facing particular discrimination in occupational and state pension changes. Government is guilty of misselling state pension changes, something the current government pensions minister said before taking up her current post. He concluded with the words of Lloyd George when introducing the first state pension scheme a century ago. He described pensions as "The fruit of security for our society". A good quote for today! The afternoon panel session took a closer look at auto-enrolment. Speakers emphasised the success of the policy, as the PPI speaker put it, 'inertia is a powerful force'. Although with only the big employers, the ACA speaker said, 'that is the easy bit'. However, it has been less effective in addressing pension disadvantage, particularly for women, the low paid and those in ethnic minorities. Future challenges include the increase in employee minimum contributions and whatever the Chancellor decides to do with tax relief in the Budget. The ACA argued that there is a need to gradually increase contributions up to around 16% - less than that is not going to provide meaningful levels of pension income. The CBI speaker predictably urged caution on this, referring to a range of employer costs in addition to pensions. Others questioned if this would have a negative impact on wage growth. In summary, the theme of the conference for me was that pension reform is moving away from the traditional characteristics of a pension. Treating pension pots as investments rather than savings, places a huge risk burden on the individuals who are least able to respond. That places even more control in the hands of market players who have a very poor track record, particularly on costs. When coupled with demographic and workforce changes, pensions face real challenges. Government cannot abstain from this because the taxpayer will have to pick up the pieces from market failure.